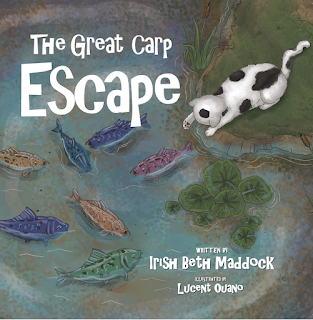 Calgary, Alberta - Irish Beth Maddock’s debut children’s picture book is based on a true story of her growing up on a lake. This story promotes some very positive values to our kids. It teaches young readers how to be a voice to those who cannot speak for themselves; to respect all creatures, no matter how ugly they may seem, and how knowledge and experience can bring about understanding and compassion. For siblings Beth and Paul, growing up on a lake and exploring the wonders of aquatic life is fun, until the children encounter a startling, “fishy” find along the shoreline. When the kids discover the moustached, scaly blue carp they found lives in the marsh near their home, they become afraid. Seasons pass and Beth and Paul avoid the swampy reeds at all costs–until a natural occurrence brings about a life-or-death situation for the creepy looking carp, right in their own backyard! With guidance from their father, will Beth and Paul be able to overcome their apprehensions about the carp and help save them before it is too late? Irish Beth Maddock was a columnist for two local newspapers, had stories published in Reader’s Digest, and broadcasted on 100 Huntley Street, CHBC Television and CBC Radio. She is a published poet, and has both performed in and directed plays and musical theater productions.